What is this sorcery??? Be ready to say: Mmm…vacon! vegan bacon rice paper facon vacon that looks like the real, bloody thing and it tastes great? How did I do that? After having so much fun with my previous Italian salame style sausage I have read today about this game changing home made vegan bacon (aka cruelty and cholesterol free vegan bacon rice paper facon vacon) on this Danish blog (thanks google translation for compensating my lack of Danish fluency!) [update the original recipe is now also translated into English], I was inspired to modify – as usual- the recipe to achieve what I think its an optimal result with my very own experiment. Crispy, yet chewy, smokey and delicious! It only took me about 15 minutes to make the most delicious vegan bacon rice paper facon vacon (yeah. Long name!) and it’s really easy to make. The rice paper has a quite hard consistency, but once you cut it into strips and briefly soak it into a small bowl with warm water, it will soon get soft and sticky. I worked quickly sticking double layer of strips together , soaked and then briefly marinated for a few seconds in a mix of spices before frying in a non stick pan. Now to the recipe. It’s very easy but let me know if you have any questions at all and I will be happy to answer. soaking the rice strips can be a pain . You can simply hold two together by quikly rinsing them with water straight from the tap. Press them together with your fingers to remove excess with fingers and put in the marinade. Don’t worry if the strips still seems to be quite hard, it will still work perfect if not better. Coconut shreds, a dash of agave syrup or maple syrup, and bbq hichory sauce with liquid smoke are a great addition both for texture and taste. Rice paper sheets cut into 2.5 cm stripes and quickly soaked for a couole of seconds into warm water, working with two stripes together will be easier, they will immediately stick to each other once wet. Let them glue together to make the slice thicker. mix all the ingredients for the marinade and set aside, except for the rice paper stripes. Fill a bowl with some warm water and soak a couple of stripes for a few seconds, they will stick together. Dont' worry, this is what should happen. remove excess water and soak in the marinade. let cook on a tray or on some kitchen paper and enjoy in sandwiches, salads, pizzas etc. Fry the strips by working them with two forks or tongs to turn them on the other side and stretch them a little to achieve an irregular shape. 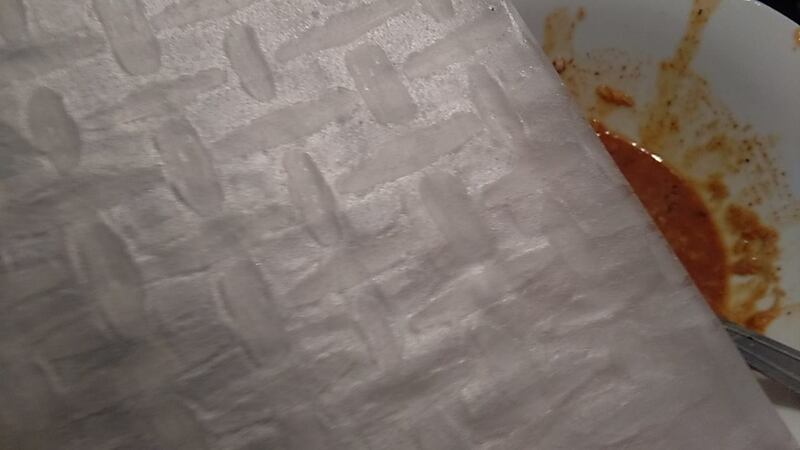 Once happy with the cooking, place on some kitchen towel to absorb the extra fat. I have tried the baked version of this recipe and am so happy with the results. I have also replaced the teriyaki sauce with a bbq hiychory sauce I found at the supermarket and added more coconut shred to improve texture. Here is the result of the baked version. Just awesome and great in sandwiches! Our new Lækon-strips landing page leads to both ways of making them. I really like that you also add chili sauce and shredded coconut – sounds delicious!! All the best from Denmark. 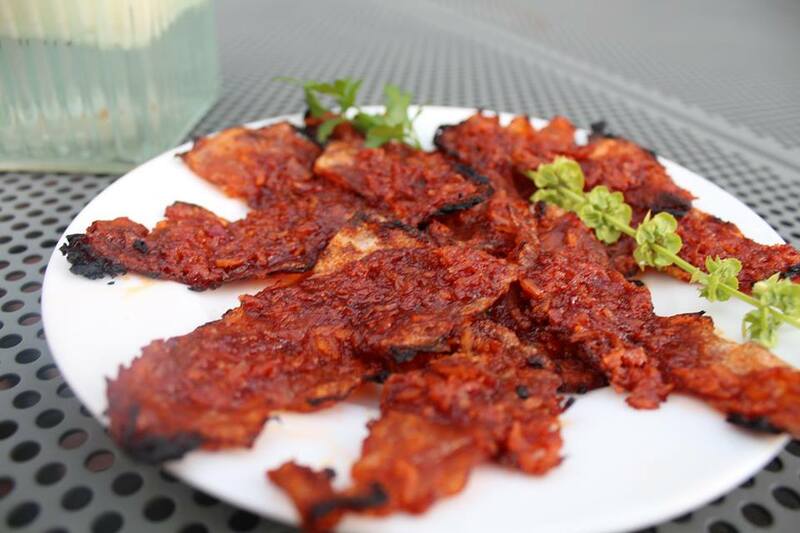 Hi: Thank you so much for the recipe and I am in the process of making the bacun now. I used what I had in the house for the marinade and cooking it in Chef Skye Michael’s bacun grease, available at his web site. Thanks again, you are a marvel! Thank you for the support Allison! You are our n.1 fan! Love to try that Lucia, hahaha frying condoms… I’ll remember that step and laugh! BTW, where do you get liquid smoke? Grazie Alessandra! The only problem with this V-acon is that we ate too much! Give it a go and let me know what you think. I am going to try the baked version next. Liquid smoke is available in Auckland at wise cicada for sure and the bulk store in mt. eden I think. Otherwise online! I am glad you enjoyed it Jenni. Experimenting is the way forward with this very new recipe,I am sure we will see many more different versions. Keep us updated on the results! I just have one thing in your recipe I’m unsure of. When you say double layer of strips what exactly do you mean? like two pieces soaked one on top of the other? I’m transitioning to vegan so which would you recommend I try first? Baked or fried? Thanks! yes I mean a double layer of rice paper basically glued together as soaked together. Someone even reccomend skipping the soaking step and just put the dry strips into the marinade as it will still soften them a little. I prefer the baked version personally. There’s no nmeed to be too precise with the strip – i even baked a lump of them stuck toghether heehe and even if irregular in shape they will work great, just bear in mind that if too thin will burn quickly so keep an eye on the oven temperature. Love this fried, so I’m going to try baking it next. I’m assuming when you bake it at 180 degrees, that’s Celsius…yes? No? The Fahrenheit equivalent is about 350 degrees so I’m going to try that but could you specify, just in case? Thank you so much! Hello! Thank you for your comment! Yes sorry I mean Centigrade, as it burns quite easy! Treat like if you ever baked kale chips…similar process. Parchment (baking) paper will help to get more crispiness! I need to find rice paper. Looks and sounds so good. Did you change the recipe? I made it when you first posted the recipe and it was amazing. 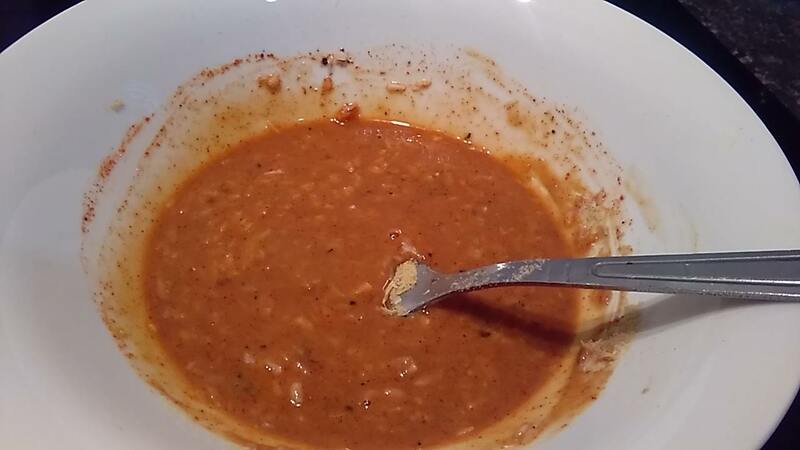 I made it again and it seemed like the recipe was different and didn’t quite taste the same. How much is 1/2 glass of water? How long do you marinade? Thank you. How did you get the coconut to a fine consistency? Just chopping shredded coconut? at the supermarket you can find different sizes of shredded coconut. From flakes to flour: just go with the finely shredded one (basically one step before flour) or use a blender to thin out flakes. Hope it helps! This was a great recipe!! I just made it for the first time this morning and I have more left for BLTs later. I don’t know if it is already in the comments, but I cut my rice paper with scissors – so much easier than with a knife. I have been looking for rice paper for ages. I made your vacon as soon as I did, and it’s amazing. I CANNOT THANK YOU ENOUGH FOR THIS!! !